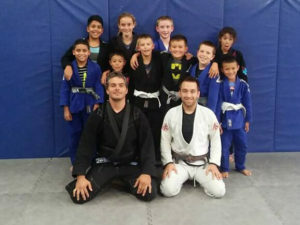 BCBJJ gym memberships provide access to unlimited Brazilian Jiu-Jitsu classes. BCBJJ offers two types of Jiu-Jitsu classes on the schedule: Gi, with a traditional uniform/kimono, and No-Gi, with shorts and a shirt. Feel free to attend any class regardless of what gear you do or do not have. All fitness levels are welcome. No previous martial arts or grappling experience is required. Instructors will teach you to develop a style that works best for you. Adult classes involve 90 minutes of cooperative partner work, technical drilling, and intense sparring. Students will practice various situational attacks, transitions, escapes, takedowns, throws, and strategies. Children’s classes involve 45 minutes of cooperative partner work, technical drilling, and light sparring. Students will practice various situational attacks, transitions, escapes, strategies, and theories to keep themselves safe. Open mat is an unstructured time for students and visitors to get more training, drilling, and sparring time. Students of all schools, experience levels, and martial art disciplines are invited to come to open mat. Open mat times can vary. Check our Facebook page for updated open mat times. Berks County Brazilian Jiu-Jitsu features a wide variety of gym equipment for students to use before, during, and after class time. Students looking to further refine their grappling skills are able to schedule private Brazilian Jiu-Jitsu classes from instructors. In these 1-on-1 sessions, instructors are able to provide personalized attention and help students looking to further refine their game. Private lesson rates and schedule vary by instructor. Contact us for more information.